Neal’s Funeral Home is approximately 87 years old. It was founded in the mid 1920’s by Ray Williams who built the building on the foundation of an old creamery belonging to Gotlib Herman that burned. Williams and his partner operated the business as Williams & Brown Funeral Home. In 1928 it was purchased by Everett and Mary Black who operated the business as Black Funeral Home until 1947. In 1948, the funeral home was purchased by James and Elva Laws who in turn changed the name to Laws & Laws Funeral Home then sold it in 1950 to James and Peggy Fallis. 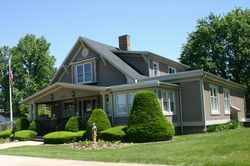 By January of 1957 the funeral home was listed on all information as the Fallis Funeral Home. Later Dennis Nead joined the staff of the funeral home. The name was changed in January 1977 to Fallis & Nead. The name remained the same until January 1981 when Dennis Nead’s son-in-law became a member. The name then changed to Fallis & Nead & Clark. In 1982, James Fallis’s name was removed from the name of the home and it became Nead & Clark. The Nead’s sold the business on December 31, 1987 to Bill and Lila Neal. Finally in 1994 the name was changed to Neal’s Funeral Home.